Now the wraps are off the BMW X7, the obvious dominating feature is its huge kidney grilles up front. Other than that, it's fairly sedate BMW fare, with a rear design featuring strong horizontal lines to emphasise the X7's width and little touches like the Hofmeister kink preserved in the D-pillar. Acoustic glass is fitted at the front of the X7 to keep the cabin quiet, the headlights are LEDs as standard and optionally can be upgraded to BMW LaserLights, alloy wheel sizes range from 20 to 22 inches and the whole vehicle measures 5,151mm tip to tail, with fully 3,105mm of that taken up by the SUV's wheelbase. The X7 can have either six luxury chairs or seven arranged in a 2-3-2 layout, which is the reason this SUV exists in the first place - because the new X5 can still be configured as a '5+2' inside. However, the X7 is much bigger physically, so even with all seven seats in place, BMW can claim boot space of 326 litres - about what you get on a typical C-segment family hatchback these days. Drop to five pews and the cargo volume swells to 750 litres, while folding the middle row of chairs down as well sees space in the back of the X7 increase to a simply colossal 2,120 litres. Inside, the dashboard is the latest BMW architecture, which means it looks lovely. As standard, and as befits a luxury flagship, the X7 will gain the twin 12.3-inch TFT screens of BMW Live Cockpit Professional, while the driver's head-up display to complement these is the third-generation type, which has a larger field and can present more information as a result. Ambient air and lighting packages enhance the cabin, while interesting touches include the 'Crafted Clarity' glass gear lever and heated/cooled cupholders. Third-row passengers aren't left in the lurch, either, as they gain air conditioning with its own set of controls in the headlining of the X7. Options will include a full Bowers & Wilkins Diamond Surround Sound system with a 1,500-watt output and a full-length panoramic roof incorporating ambient LED lighting. Four engines, split evenly between turbocharged petrol and diesel units, will be offered. On the former score, there's the xDrive40i and xDrive50i, one a 3.0-litre six-cylinder with 340hp and the other a 4.4 V8 with 462hp. The V8 won't be coming to Europe and most buyers here are likely to stick with diesel. There's an M50d, with the ludicrous quad-turbo 3.0-litre straight-six from the 750d doing the donkey work. With 400hp and 760Nm, this 2.5-tonne behemoth will run 0-100km/h in 5.4 seconds and go on to a limited 250km/h maximum speed. 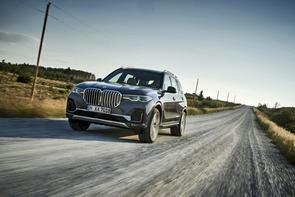 But as it'll be expensive to buy, that leaves the main contender as the X7 xDrive30d. Its 3.0-litre straight-six has three fewer turbos than the M50d, but still delivers respectable numbers of 265hp at 4,000rpm, backed up by 620Nm from 2,000-2,500rpm. Like all X7s, it's all-wheel drive and power is sent to the wheels via an eight-speed Steptronic automatic gearbox, so 0-100km/h takes seven seconds dead and the top speed is 227km/h. BMW quotes best eco-stats of 43.5mpg (6.5 litres/100km) and CO2 emissions as low as 171g/km, although these are NEDC correlated numbers. BMW gives the X7 a veritable arsenal of standard equipment to make all this weighty SUV luxury handle as it should, so twin-axle air suspension, Integral Active Steering, electric anti-roll stabilisers and bespoke xDrive and gearbox settings are all part of the kit list. An off-road specific differential lock will be bundled into an option pack for those who like getting their SUVs' tyres dirty.